How to combine Managed Self-Service BI with Data Vault 2.0? Last month we talked about a hybrid architecture in Data Vault 2.0, where we explain how to combine structured and unstructured data with a hybrid architecture. To follow up on this topic, we now want to explain how your business users (especially power users) can take a benefit from it with the managed Self-Service Business Intelligence (mSSBI) approach in Data Vault 2.0. Data Vault 2.0 is a concept for data warehousing, invented by Dan Linstedt. It brings many new features that help anyone who is concerned with Business Intelligence entering a new age of data warehousing. 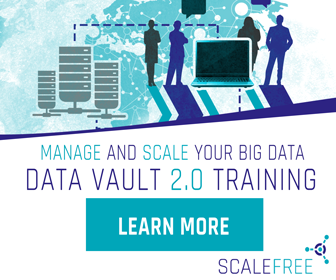 Data Vault 2.0 is a Big Data concept that integrates relational data warehousing with unstructured data warehousing in real-time. It is an extensible data model where new data sources are easy to add. When our founders wrote the book, they required a visual approach to model the concepts of Data Vault in the book. For this purpose, they developed the graphical modeling language, which focuses on the logical aspects of Data Vault. The Microsoft Visio stencils and a detailed white paper are available on www.visualdatavault.com as a free download. This year we already wrote about the modeling of hubs and links in Data Vault 2.0. Now, we want to introduce you the third standard entity, the Satellite. With the advent of Data Vault 2.0, which adds architecture and process definitions to the Data Vault 1.0 standard, Dan Linstedt standardized the Data Vault symbols used in modeling. Based on these standardized symbols, the Visual Data Vault (VDV) modeling language was developed, which can be used by EDW architects to build Data Vault models. When our founders wrote the book, they, required a visual approach to model the concepts of Data Vault in the book. For this purpose, they developed the graphical modeling language, which focuses on the logical aspects of Data Vault. The Microsoft Visio stencils and a detailed white paper are available on www.visualdatavault.com as a free download. In June this year we published another newsletter how hubs are modeled in the accounting industry. In this Newsletter we explain the function of standard links and how the modeling in the banking industry works. One common requirement in data warehouse projects is to provide data lineage from end-to-end. However, custom solutions (for example custom Meta Marts for self-developed Data Vault generators) or tools from different vendors often break such end-to-end data lineage.